China and Malaysia agreed on November 4 that bilateral ties are in their best period ever and that cooperation in the long term will be sought on regional infrastructure projects. During their meeting in Beijing, President Xi Jinping told Malaysian Prime Minister Najib Razak that his guest had inherited the spirit of his father, Abdul Razak Hussein, the second Malaysian prime minister, and had carried China-Malaysia ties forward. "The bilateral cooperation is in line with the fundamental and long-term interests of both countries, and we are willing to deepen the cooperation in all sectors to benefit the two peoples," Xi said. He added that he was glad to see that the consensus reached in previous bilateral meetings has been translated into concrete results. 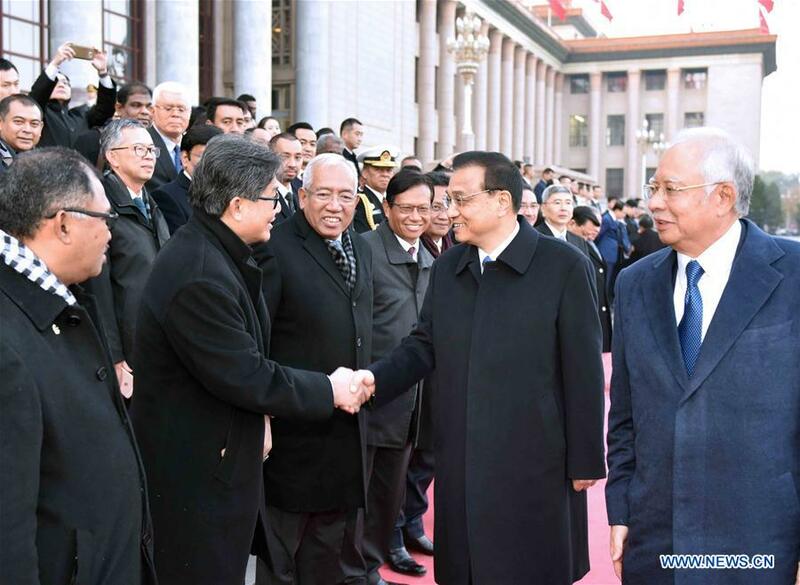 Najib, who arrived in Beijing on November 1st for a six-day trip, described his visit as "extremely successful". Bilateral trust has been enhanced, and Malaysia is ready to boost cooperation with China in the fields of investment, transportation and port construction, he added. Najib and his Chinese counterpart, Premier Li Keqiang, witnessed the signing of a dozen deals that include the purchase of four patrol ships and loans for the construction of a planned railway line in Malaysia. Because his third official trip to China followed the recent visit by Philippine President Rodrigo Duterte, some Western media portrayed the visit as a move by China to counterbalance the influence of the United States in the region and as another setback for the US policy of rebalancing to the Asia-Pacific. Foreign Ministry spokeswoman Hua Chunying told a news briefing on Wednesday that China's development of normal diplomatic relations between countries never targets any third party and that the enhancement of mutually beneficial cooperation between China and Malaysia is conducive to regional peace and development. Han Feng, a researcher at the Center of Southeast Asian Studies in the Chinese Academy of Social Sciences, said the Western media portrayal is unreasonable, since Sino-Malaysian ties go back a long way and Malaysia was the first country in the Association of Southeast Asian Nations region to establish a diplomatic relationship with China. Total bilateral trade volume was $97.3 billion last year, according to Chinese government statistics, and trade with China accounted for 15.8 percent of Malaysia's total trade worldwide. Among ASEAN countries, Malaysia has been China's largest trading partner since 2008. "China and Malaysia both are reforming their economies. Given the scale of trade, it is normal for leaders from both countries to strengthen mutual political trust and facilitate practical cooperation," Han said. China has the capital, technology and experience to build infrastructure, facilitate cooperation and generate win-win opportunities in Southeast Asia, he added.